← Emeralds to a sea cucumber. Platinum to a moose. Alternately: Putting the cart before the horse. Getting your priorities turned around, or otherwise being mistaken about the relative importance of things. Mixing up cause and effect. Notes: 本 and 末 are root and branch of a tree; metaphorically this becomes the main and peripheral aspects of something. 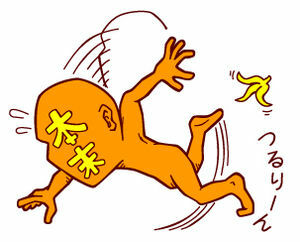 転倒 is reversal, flipping, falling. I occasionally misremember this phrase in flipped form as “転倒本末,” which I suppose is appropriate. A dramatization of what happens inside your head when you do this, I guess. Source. This entry was posted in Japanese, Yojijukugo and tagged cart before the horse, 転倒, priorities, 本末. Bookmark the permalink.